This stunning photo shoot was done by PRIDE magazine. 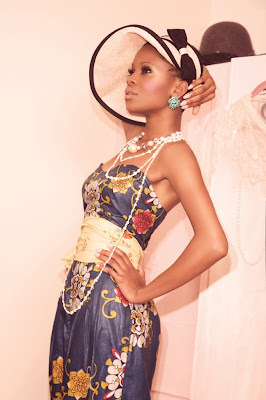 It aims to "Give African prints a high-fashion twist with vintage English styling". I think it succeeds tremendously and just love love love it! Saw it first on shopliquorice, my new fave fashion blog. Gosh ...so elegant and cute! iLove! I actually don't really like it. Having tea is such an English tradition that it contrasts too much with the African prints. And the white gloves are weird. I like it but I think they missed the boat at the same time. Like they could have done the Nigerian version of it instead of simply having black girls wear Nigerian prints at an English tea party. Like how many Nigerians have tea parties and certainly not with China like that. It feels a bit contrived. The work itself is superb, but the idea is hackneyed and uncreative. And I feel like this is what 90% of the "African Designers" out there today do. They just slap ankara on something that Europeans or Americans have already done or pioneered and then everybody oohs and aahs and says "wow that's so creative" when really it's not. wow this is soo cute! love it! sugabelly said it all already!